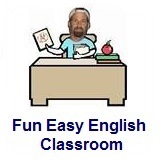 ﻿ Fun Easy English - new classroom free online classes english language lessons speaking listening writing reading september 29. Today in the classroom you are going to learn some idioms beginning with the letter O. Today learn idioms beginning with the letter O. The expression probably originates from the idea of choosing up two sides for a game in which both teams need an even number of players. If there were an uneven number of people wanting to play, the last (odd) person was left out. The expression has broadened in its meaning to describe anyone who is not included or made to feel part of a group. When the expression is used to describe a woman, the word “man” does not become “woman”. 1. An uneven number of boys wanted to play the game, so that when both teams had chosen the same number of players, one boy was left standing in the middle. John was the odd man out. 2. I felt as though I didn’t belong with the group of people at the party. I was odd man out. ODDS AND ENDS small items that are left over, don’t match, or are missing a mate 1. The repair shop is full of odds and ends that Mr. Bell collects and keeps just in case he can use them to fix something else. 2. I keep all my odds and ends in this drawer, but it’s becoming so full of junk that I can’t find anything anymore. of age old enough for certain privileges When he became of age we had a big party for him to celebrate. of age fully developed Cars became of age many years ago. of course Certainly Of course you can use my car if you want to. off again, on again uncertain The plans for the party were off again, on again. off and on intermittently It has been raining off and on since this morning. off base inaccurate He was really off base on his estimate of the budget. off beat unconventional The movie was very off beat. off center misaligned The picture looks good on that wall but it's a little off center. off color inappropriate and offensive He likes to tell off color jokes at work. off duty not working The police officer was off duty when the incident occurred. off guard by surprise The request caught her a little off guard. off one's back away and not bother me I wish he would stay off my back. off one's chest stated and discussed She was able to get the problem off her chest. off one's hands out of his possession He was able to get that car off his hands. All of these expressions, including off one’s rocker, are used in a light-hearted, slightly humorous sense. 1. Mrs. Crowell is convinced she sees ghosts in the halls, and that they talk to her. I think she’s off her rocker. 2. You must be off your rocker to think that the boss will give you such a big pay raise. He hasn’t given anyone else a raise like that. off the beam incorrect His comment about the business plan is off the beam. The expression can be used either literally (as in sentence 1) or figuratively (as in sentence 2). 1. Jennifer likes to take her vacations in the major resorts where everyone goes. She likes the big and noisy crowds instead of places that are off the beaten track. 2. Alex has never followed the crowd or done things just to please others. His way in life has been off the beaten path. off the beaten track not well known This restaurant is certainly off the beaten track. Off the cuff is usually applied to speaking or writing. On the spur of the moment means that one makes a decision to do something suddenly and therefore without much preparation. 1. Holly is a great speaker. Most people like to plan their speeches carefully in advance, but Holly prefers to speak off the cuff. Even so, her speeches are always a great success. 2. I can’t give you an exact figure for the number of students we have at the university, but off the cuff I’d say about 25,000.
off the hook out of trouble He is off the hook now that they realized it was not his mistake. off the record private He told the reporters to keep the information off the record. Synonym: off the cuff 1. Melissa didn’t know how many people had called, but guessing off the top of her head, she said about a hundred. 2. Richard was unsure what kind of advertising campaign the company wanted, but he made a suggestion off the top of his head and they liked it. off the wagon drinking alcohol again after stopping for awhile He is off the wagon. Antonym: run of the mill 1. Most of Kevin’s suggestions are sound and practical but a few of them are really off the wall. I wonder how he comes up with them. 2. Some dress designers today are designing fashionable clothes that are off the wall. I prefer classic designs, and I can’t imagine wearing some of those bizarre fashions. An old boy network serves as a way to get jobs and spread information, sometimes to the exclusion of others who are outside the network. 1. Mr. Turner got his job through the old boy network, which consisted of the friends he knew when he was at the university. 2. Sometimes it can be very hard to get hired by certain companies because they depend so heavily on hiring through an old-boy network. If you aren’t a part of it, you don’t have a chance. Describing someone as an old fuddy-duddy is usually seen as harmless and humorous, whereas calling someone a stuffed shirt can be rude. The expression can refer to either a woman or a man. 1. Tom is a bit of an old fuddy-duddy. He refuses to get a mobile phone or a computer. 2. My music teacher is pretty cool, but my history teacher is an old fuddy-duddy. Synonyms: in a rut; on a treadmill 1. Every New Year’s Eve, we go to the same restaurant for dinner and the same hotel for dancing. It’s getting to be old hat and I’m tired of it. Let’s do something different this year. 2. I’ve heard that idea a thousand times before. It’s old hat. Can’t you think of anything new and different that we could try? on a diet trying to lose weight Are you on a diet or something? on a shoestring with very little money He started the new company on a shoestring. The expression originally referred to American Indians, who were described as on the warpath (literally on the way to war) when they were preparing for a fight. 1. I decided to get out of the house until my father calms down. He was really on the warpath when he saw that I had damaged his new car. 2. The manager is on a rampage because he found out that the company management doesn’t plan on keeping him when they close his department. He’s really angry. A treadmill is a machine consisting of a continuous belt or moving steps that circle around and around and to which there is no end. The expression is often used to describe one’s job or daily life. 1. Mr. Jones goes to work and does the same old job every day, and he never does anything different. He’s on a treadmill. 2. Everyone thinks I’m so predictable, but some day I’m going to get off the treadmill and do something adventurous. 3. They’ve been on the treadmill their whole lives. They would feel very uncomfortable doing anything spontaneous, so it would be impossible for them to get off and do something different. on again, off again uncertain The plans for the party were on again, off again. on and off intermittently It has been raining on and off since this morning. on and on tediously The meeting continued on and on until the evening. on an even keel running smoothly The department is finally on an even keel. on behalf of representing The lawyer went to the meeting on behalf of his client. on call ready and available to work The technician was on call the entire night. very rarely 1. Jean’s parents encouraged her to accept the job with the prestigious company in New York. They told her that a job offer like that comes along only once in a blue moon. 2. Roger and Sandy like to stay at home. They rarely travel and they almost never go out to dinner, though they go to the movies once in a blue moon. Synonym: seventh heaven, in 1. Sharon loved horses, and when she finally took her first riding lesson, she was on cloud nine. 2. Seth might be angry if you interrupt his video game—it’s new, and he’s on cloud nine. on credit using a credit card She decided to buy the table on credit. on easy street financially comfortable He has been on easy street since he sold his business. on edge nervous and irritable He has really been on edge because of his new job. on end continuously We worked for hours on end last night. ONE FELL SWOOP one quick, sweeping action 1. The army surrounded the enemy soldiers without their knowledge, and in one fell swoop were able to cut them off from their supplies. 2. Dianne swept in with her presentation, and in one fell swoop she garnered the support of every member of the board of directors. on faith without question She took his excuse on faith and decided to stay with him. on guard wary He is staying on guard for any possible security problems. on hand available The coffee shop had extra pastries on hand. on hand nearby Please keep your dictionary on hand in case you need it. on hand present The speaker will be on hand after the lecture if you have questions. On hold specifically refers to postponing some action, whereas put something on ice means to store or reserve some item for later use. Something that is on the back burner has a lower priority or is less important than something else. 1. We had planned to start building the new shopping center next month, but the company’s profits are down so the project has been put on hold for a while. Synonyms: salt (something) away; save (something) for a rainy day; on the back burner; on hold 1. We didn’t need all the money we had raised, so we decided to put some of it on ice until our funds were low. 2. I’m glad we found enough supplies to do the job, but I wish we had enough to put some on ice. We will need some next year too, and we may not be able to find any then. The expression suggests a person who is about to collapse for the last time because his or her legs no longer have the strength to carry him forward or hold him upright. 1. This car is practically worthless. It’s in the repair shop more than it’s on the road. I think it’s on its last legs. 2. The company is selling its assets and is about to declare bankruptcy. It’s on its last legs. on one's back bothering him She has been on his back all week to get a new job. on one's feet recovered She was on her feet after a long illness. on one's shoulders his responsibility The mistakes made in the department were on his shoulders. on one's toes alert The students were expected to stay on their toes. on purpose intentionally I think that she spilled the drink on purpose. on shaky ground not secure His position at the company is on shaky ground. on the air broadcasting That television program has been on the air for awhile. The expression on the back burner comes from cooking on a standard stove, which has four burners, two in front and two in back. The burners in front are used for immediate cooking, while the ones in back are often used for simmering or keeping things warm. To move something to the front burner means to make some project highest priority. 1. The boss isn’t sure he wants to pursue that new project right now. I think it’s on the back burner until the current project is finished. 2. Because of the country’s debt problems, the government has had to put its plans to expand the national medical program on the back burner. Antonym: out to lunch 1. You’ve been making too many mistakes these days. You’d better get on the ball if you want to keep your job. 2. I can’t seem to concentrate today. I’m just not on the ball. on the ball intelligent He is really on the ball. The expression is usually used with electronic devices. It is not used with more mechanical devices such as cars or other vehicles. 1. We can’t watch the football game at my house. My television is on the blink. 2. The clock in the office has been on the blink for months. I don’t think they’ll ever get it fixed. on the block for sale The office building is on the block. on the bandwagon participating in the same thing because of the actions of others Now everyone is on the bandwagon. on the beam correct What she said was on the beam. on the blink not working The television is on the blink. on the button exactly on time She usually arrives at work on the button. on the coat tails of because of the previous actions of The actor got the part on the coat tails of his famous brother. on the dole receiving assistance The area is very poor and there are many people on the dole. on the dot exactly on time She usually arrives at work on the dot. Synonym: on the blink 1. This television works for a few minutes and then the picture fades out. It’s on the fritz. 2. We’d better think about getting a new refrigerator, because this one has a puddle of water under it every few days. It seems to be on the fritz. ON THE GO constantly busy; very active 1. My neighbor has four young children, and she is always driving them somewhere: to school, to dance lessons, to visit friends, to the doctor’s. She’s always on the go. 2. Some food companies now make ready-to-eat breakfast food for people on the go. They can just put the food in the microwave oven or toaster and take it with them in the car. on the house free The room at the hotel was on the house. Compare to: on the up and up 1. I know you don’t believe me, but what I’m telling you is on the level. 2. The car dealer offered Robert a chance to buy a fancy car at a big discount. Robert was suspicious because he didn’t know if the deal was really on the level. on the loose wandering around Some of the animals at the zoo were on the loose. on the make trying to take advantage He is on the make and will attempt to take your money. on the mend feeling better She is on the mend after the car accident last week. on the move going to many places She is traveling and has been on the move for many months. Compare to: hit the nail on the head 1. Their parents tried not to tell them where they were going, but the children were too clever for them. They guessed it on the nose. 2. The children’s father told them each to think of a number between one and ten. The child who chose the closest number to the one he was thinking of would get the larger piece of candy. His youngest daughter picked the number on the nose. on the other hand in contrast She is intelligent but on the other hand she is very lazy. on the road traveling Some truck drivers are almost always on the road. The expression is often used to describe a long-term relationship or a marriage (sentence 1), but it can also describe a non-romantic relationship (sentence 2). The expression originates with the image of a ship that has been cast against the rocks and is about to break up. When the expression means “with ice” (as in sentence 3), the ice cubes in the glass are being compared to rocks. 1. I read in the tabloids that those celebrities’ relationship is on the rocks. I wonder if it can be saved? 2. Mr. Smith was afraid that after the stormy meeting, his relationship with his client was on the rocks. He decided to call his client later in the day and try to straighten things out. 3. When Judy goes to a bar, she always orders a drink on the rocks. on the same wavelength thinking the same way We have been on the same wavelength for months. on the sly secretly We went to the restaurant on the sly. ON THE SPOT in an awkward social situation (sentence 1) or immediately and nearby (sentence 2) 1. I’m sorry to ask you these questions without giving you a chance to prepare—I didn’t mean to put you on the spot. 2. Sherry thought that the doctor would make a future appointment to give her the shot, but he wanted to do it that day. “We can do it here, on the spot,” he said. on the spur of the moment suddenly They decided to go to Los Angeles on the spur of the moment. The expression is used when one is trying very hard to recall something such as a name, date, word, or fact and feels that he or she is just about to remember it. The expression suggests that the information is so close to being recalled that it is at the front of one’s mouth. 1. Chris knew the woman, but he couldn’t remember her name. It was on the tip of his tongue, but it just wouldn’t come. 2. Martha was trying to recall the name of the restaurant where they had eaten. It was on the tip of her tongue when someone interrupted her thoughts. Compare to: on the level 1. The salesman offered us an unbelievable price on computer equipment. Do you think his offer is on the up and up? 2. Governor Russell is a very honest politician. He would never do anything that was not on the up and up. The expression on the wagon usually describes someone who is unable to handle alcohol or who is an alcoholic rather than a person who chooses to abstain for religious or other personal reasons. On the wagon refers to alcoholic drinks whereas cold turkey refers to abruptly stopping the intake of drugs, cigarettes, and other habits. 1. Peter used to drink alcohol to excess, but now he doesn’t drink anymore. He’s on the wagon. 2. I realized I was an alcoholic some years ago. I finally got help and I’ve been on the wagon ever since. on the whole in general On the whole I think it is a good idea. The expression suggests how dangerous it is to tread (walk) or skate on ice that, although frozen, is not thick enough to support one’s weight. 1. Steve is going to run into trouble if he continues to arrive late at work. He’s on thin ice with the boss already because he spends more time talking on the phone than working. 2. Anita is in serious trouble at the university. Her grades are poor and unless she does well on her final exams, she may be skating on thin ice. 3. The children’s mother couldn’t stand many more of their demands. She told them that they were treading on thin ice because they were about to make her lose her temper. on time at the scheduled time Our train arrived right on time. on top in the lead The home team was on top for most of the game. on top of in addition to On top of everything else she wants more jewelry. on top of managing We are able to keep on top of our work. on top of aware of She is usually on top of the latest fashion trends. once and for all absolutely She told him once and for all that she would not take the new job. once in a blue moon rarely She only goes to that restaurant once in a blue moon. once in a while occasionally We go to that restaurant once in a while to eat Japanese food. once or twice a few times We went to that restaurant once or twice. once-over quick look She gave the book a once-over before deciding to buy it. The expression suggests that a person who is an open book is easy to “read” or understand. 1. Cindy hides nothing about how she spends her time. Her life is an open book. 2. James and John are as different as night and day. James is an open book, but John is very secretive. Open minded and closed minded generally refer to a person’s overall outlook or approach, whereas keep an open mind is used to describe one’s approach to one particular situation or topic. 1. Julie’s father’s mind was made up not to let her have her own car. She said that he didn’t have an open mind about the matter, and that he had not given her a fair chance to persuade him. 2. I have almost decided to vote for the conservative candidate, but I’m still willing to listen to what the other candidates have to say. I’m trying to keep an open mind about all the candidates until election day. Similar to: open mind, keep an 1. As a new employee, it’s important to be open minded and enthusiastic. You aren’t expected to know everything about your job yet, but you should be open to learning new things. 2. Kim is definitely an open minded person. She is very tolerant of different attitudes, cultures, and religions. Synonym: out of the blue 1. Erica didn’t expect James to propose marriage so quickly. For her, the proposal came out of a clear blue sky. 2. Spencer hadn’t sent his resume out, so when somebody called him for a job interview, the offer came out of a clear blue sky. The expression is usually used to describe a social situation (sentence 2) but probably originated with printed material (sentence 1). 1. This book is no longer available in the library. It’s out of circulation. 2. Mrs. Winter took her husband’s sudden death very hard, and she doesn’t have the will to get out and get on with life. She’s taken herself out of circulation. out of control chaotic Yeah, but it was out of control. Synonyms: bite off more than (one) can chew; in over one’s head 1. I once took part in a chess tournament and got the chance to play a grand master. I lost in just five moves. I was really out of my league. 2. After I started my new job, I quickly realized that I was completely out of my depth. Nothing I’d learned in school or in my previous jobs had prepared me for the new challenges I had to face. Antonym: in (one’s) element 1. Bob felt out of his element at the crowded party. He does much better with small groups of people. 2. The beginning of a presentation is sometimes difficult. You feel out of your element standing in front of an audience. But if you’ve practiced your talk, it gets easier once you get started. Synonym: out of a clear blue sky 1. We were walking down the street when from out of the blue an old classmate we hadn’t seen for years appeared. 2. Pam was driving down the highway when, out of the blue, a truck crossed in front of her and she had to slam on her brakes. out of the book directly from the book The exams are all out of the book. OUT OF THE FRYING PAN AND INTO THE FIRE from a bad situation to one that is even worse 1. Edith’s parents were happy when she broke off her friendship with Ralph, until she started seeing George, who is an even worse influence on her. She’s jumped out of the frying pan into the fire. 2. Tim didn’t like the extra responsibility of being an assistant manager, but now he’s decided to accept the position of full manager. He’s leaping out of the frying pan into the fire. The expression is often used to describe no longer being in danger of dying (sentence 1). It can also be used to describe situations equally critical, such as the demise of a company (sentence 2) or the death of someone’s political life (sentence 3). 1. The doctor told the boy’s parents that he was no longer in danger of dying—he had made it through the night and his high fever had returned to normal. He was out of the woods. 2. The accountant was trying very hard to find a bank that would loan the company money to stay in business. When he found a bank, the company president was relieved, but the accountant told him the company was not out of the woods yet. 3. There was quite a scandal brewing, and it looked like it would cause the downfall of several high-ranking government officials. Fred thought he had avoided being touched by the scandal, but he wouldn’t be completely sure for a few weeks. He wasn’t out of the woods yet. Compare to: know if (one) is coming or going (sentence 1); know beans about (something); all wet, for the birds (sentence 2); bats in (one’s) belfry; off (one’s) rocker; screw loose, have a (sentence 3) 1. I can’t believe I was so absent-minded that I erased my entire hard drive! I’m really out to lunch. 2. You don’t know what you’re talking about! You’re out to lunch. 3. That old soldier is a little out to lunch. He wanders around here telling everyone old war stories as though the war was just yesterday. Similar to: in a bind; in a fix; between a rock and a hard place; between the devil and the deep blue sea 1. They agreed on the price of the car with the salesman, but now they can’t borrow enough from the bank. They’re over a barrel because they’ll lose their deposit if they can’t come up with the rest of the money. 2. If I look for another job, the companies I interview with are going to want to check with my current boss. But I don’t want him to know I’m looking for a new job. I’m over a barrel. 3. I had to borrow some money from a colleague at work, and now he wants me to help him fix his car on Saturday. I really don’t have time to do it, but he’s got me over a barrel since I owe him a favor. over one's limit exceeded your spending limit It appears you are over your limit. The expression is used for people and animals, but not for nonliving things. 1. My dog liked to play when he was young, but now he sleeps all day. He’s over the hill. 2. Don’t you dare tell me I’m over the hill. I may be old but I still feel as young as I did thirty years ago. OVER THE TOP beyond expectations; outside normal or accepted boundaries; exaggerated 1. I know my question annoyed him, but his response was over the top. He really needs to apologize for his rudeness. 2. Your behavior is sometimes a bit over the top. You’ll really have to act more appropriately if you ever want to do well in this business. 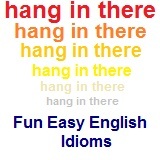 This idiom is really good to use in a situation where a group of things cannot be described with a single word. For example using "odds and ends" from the refrigerator to make a meal means using a lot of partially used food items for preparation.